Speaking of Bears . 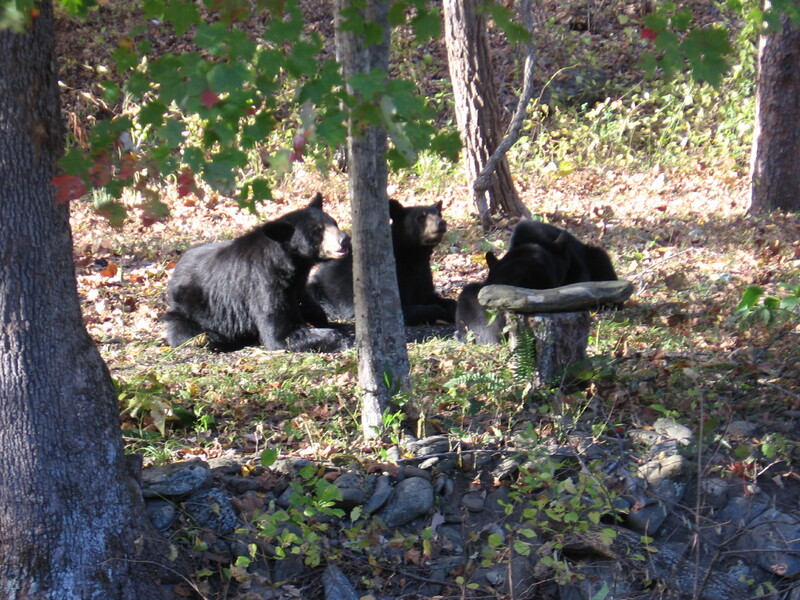 . .
Mama and three cubs chilling across the creek. This would be prior to the star-crossed lovers meeting. It’s the last push to fatten up before winter for our local bears, so we’ve been seeing them more often–emptying the bird feeders, eating acorns and fishing something out of an old flower-pot (still can’t figure out what!). Yesterday we had six bears out back at the same time. One mother and male cub were under our feeders and a second mother with two female and one male cub were across the creek seeing what they could find there. We sensed there could be trouble. The cubs seemed curious about each other. The single male and one of the triplet females kept maneuvering to get a better look at each other. At one point the male chased the two sisters up a tree, but one of them kept edging lower and lower. Finally, these two cubs from different mothers touched noses near the base of the tree and began playing. I have to believe this is an unusual thing to see–rival families playing amicably. But it was not to be. Like Romeo and Juliet, the parents noticed what was happening and a mad chase ensued with mamas challenging one another and cubs scattering every which-a-way. Everyone eventually went their own way and I suppose that will be the end of young love. Maybe they’ll find one another again when the time is right. You two and your bears worry me. Daniel shared the mace story with us. But at the same time I envy you the watching of them!